Steve Jackson Games was one of the early entrants into the papercraft-for-gaming field. In the early 1980s, they started releasing "Cardboard Heroes" which were printed cardstock sheets with 25mm images of monsters, characters, etc. You'd cut them out with a razor blade (according to the instructions below) and fold them together. The images included both font and back sides. Eventually the line would include buildings and layouts as well. Somehow among my many gaming possessions I managed to find a sample pack of Cardboard Heroes from the 1980s. Slipped inside a tight Ziploc pouch were three four inch by seven inch cardstock samples. One was printed in 1982 and says it is from the "Cardboard Heroes: Fantasy Set 10 – Traps and Treasures" product. Another simply says Cardboard Heroes and 1983 while the last has no date. The two unidentified sheets are all obviously player characters of a fantasy design, so the best guess is that they are samples from "Cardboard Heroes: Fantasy Set 1 – Player Characters" or from "Cardboard Heroes: Fantasy Set 11 – More Player Characters." All of the sets are listed (and still available in PDF format!) from SJG here. 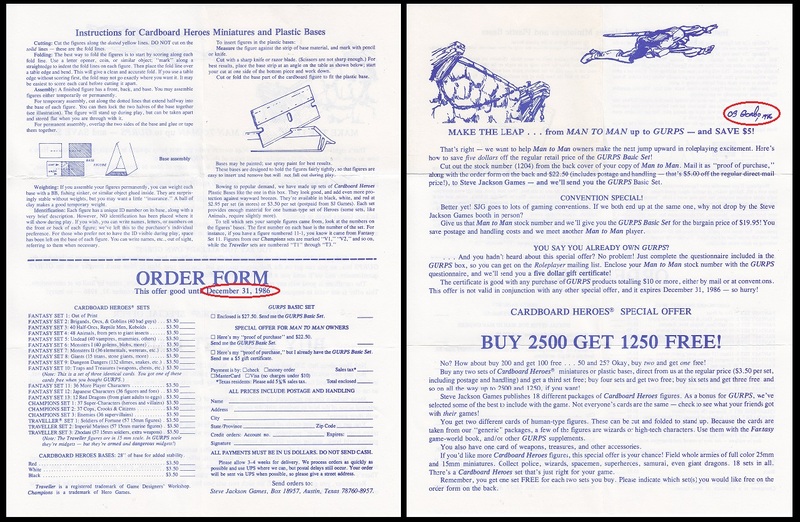 Three other things were slipped in the pouch: A Car Wars Catalog (no date, set up as a third of a page flip book format), a Customer Satisfaction Survey, and a combination Instruction Manual, Order Form, and advertisement for the Man to Man Combat System. That final sheet gives us a good time frame for when they would have been available to me. 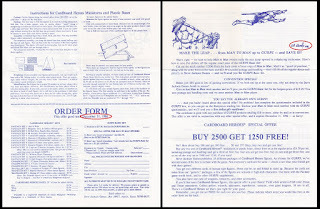 On one side, the order form says it is no good after December 1986 while the artwork for Man to Man ad is signed by the artist with a 1986 year as well. Since I would have had to have gotten this at a convention, it's most likely this was handed out at Gen Con XIX at the MECCA in Milwaukee, WI.